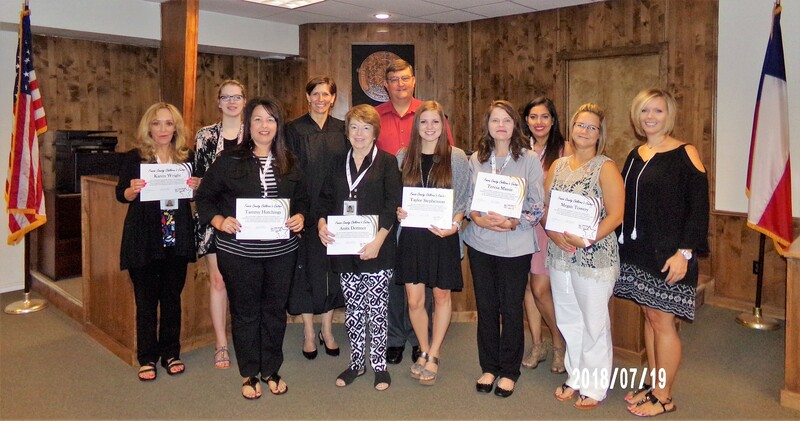 Ten local people recently completed training and were sworn-in to become volunteer CASA advocates for children in foster care. The Honorable Judge Lauri Blake of the 336th District Court administered the oath to the new volunteers. New child advocates include Karen Wright, Morgan Lewis, Tammy Hutchings, Anita Dettmer, James Crawford, Taylor Stephenson, Teresa Massie, Machaella Dennis, Megan Towery and Nicole Brown. In the year ending August 31, 2017, CASA served 118 children, which was a 42% increase over the previous year. In the first 10 months of the current fiscal year, CASA has already served 118 children. In fiscal year 2017, the number of court hearings CASA attended increased 74% and the number of active volunteers increased 68%. CASA is one program of several programs for abused and neglected children that are operated by the Fannin County Children’s Center. For more information call (903) 583-4339 or visit www.fanninccc.org.